Brief Synopsis: Young Booster Carter is forced into a difficult position by his manipulative father. Issue Reprints: This issue has been collected in Booster Gold Volume 2: Blue and Gold. The first chronological appearance of Booster Gold's father is seen the same day as the football game between Gotham University and Ohio State. (Since Ohio State is listed second, it is assumed to be the home team, and therefore the likely location of this meeting.) Rarely even mentioned in Booster's previous origins, this is the first time that Booster's father has been seen alongside a pre-Booster Gold Michael Carter. The elder Carter's comments indicate that he is now extorting his son, who had tracked him down. Other origin stories are clear to indicate that Booster's father had left the family, but Booster's role in relocating his father has never been revealed. By the time that this encounter takes place, Booster has already been gambling on (and throwing) his own football games for some time. Appearance of Michelle Carter, Booster Gold's fraternal twin sister. Michelle was briefly costumed as Booster's sidekick, Goldstar II, and will be slain in a struggle against alien invaders in Booster Gold, Vol. 1, #22. Note that Michelle's hair color is miscolored in this issue: Michelle has always had blond hair like her brother. This error is likely due to confusion on behalf of the colorist as the original Goldstar, Trixie Collins, was a red-head. 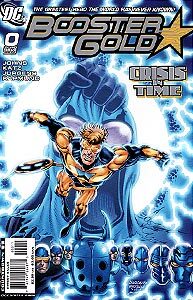 Boosterrific Review: Booster Gold's origin story is retold in an issue with direct links into a mini-series that took place nearly 15 years earlier. This combination of tying new readers into established DC continuity is what series writer Geoff John does best. And here he does it to perfection. Highly recommended. Having the artist of that original mini-series (Zero Hour) also working on this issue only makes the situation that much more enjoyable. This issue features one of the best panels in the series, and Boosterrific was kind enough to post it up on his review. The whole "Do you think they saw us?" part was classic! This was a great one. Bootser ponders his past, enjoys time with Ted Kord and gets into a funny fight with Parallax and Extent. A fun issue.